I’ve spent months revamping my shop in order to make room for a large hand tool cabinet. I’ll blog more about that later, but all the moving of equipment has given my double garage shop a new look, so it’s time to update this entry from my old 2010 photos. Here is the back wall of the garage as I used it for almost twenty years. Some of that storage had remained untouched for that long, too. After two days of salvage and deconstruction, the old back bench was removed, the storage eliminated or reassigned to different spaces, and my major machinery moved into place: the drill press and drill storage cabinet below it, the radial arm saw used for cross cutting, and my router table. 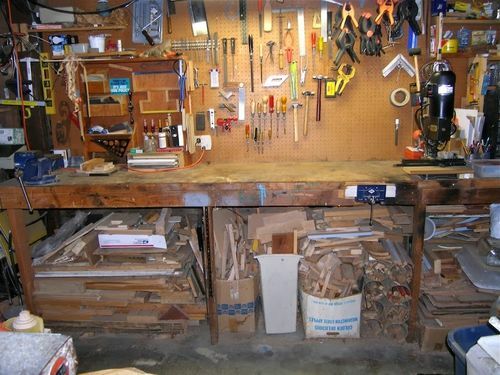 I left four feet of bench on the right for parts bins and the mortiser. 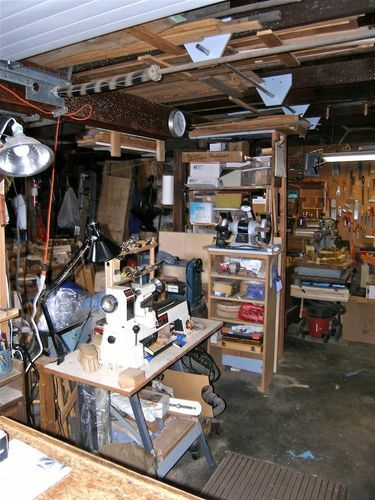 My old set up had a mini-lathe on one side of the garage and my Woodfast bowl lathe on the other side, near its 220 plug. That meant lots of walking back and forth to use accessories between the two lathes. 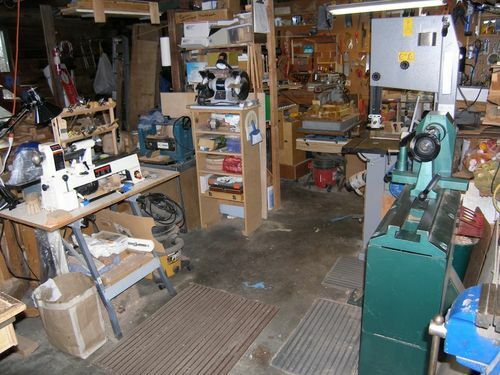 I decided to make the right hand side my turning station, so moved the mini-lathe and grinder, got rid of a shelf my mother stored gardening stuff on (right smack in the middle of my shop! Nuisance…now far away against the windows where she can call the wall her own) and put the small workbench and temporary storage of my hand tools on the left side of the garage, along with temporary wood storage. Band saw remained where it was. 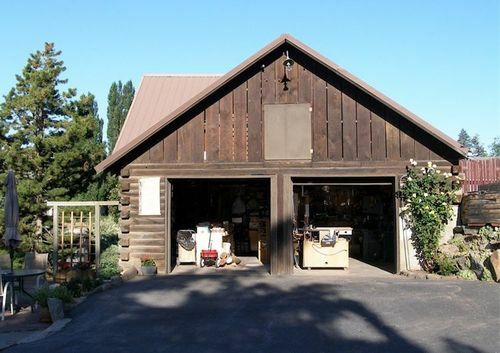 So, the outside still looks pretty much the same, including the table saw cabinet on the right and mama’s little red wagon. And yes, I’m aware every day how lucky I am to have all this space! 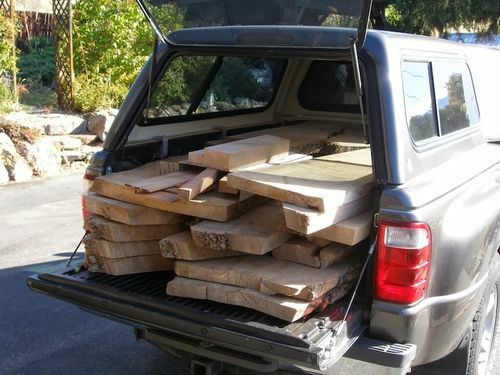 And here is the load of beautiful Elm I bought in Spokane from mike1950 and hauled home to make the hand tool cabinet with. it is now being processed from 8/4 slabs with my old-time Skill Saw (hard work) to prepare it for the band saw and final dimensioning. The cabinet I’m working on will replace the open hand tool storage pictured behind the small workbench. So, Here’s To 2014! Barb’s Year of the Cabinet! I’ll blog it’s construction, but I’m hoping this shop update will last me for a very long time now. Nice workshop Barb. looks like you rolling jigs assist the tool operations. Thanks, Karson. Yes, the drill press cabinet is height adjustable and I use it if a long board needs to sit flat on the drill press table, or as outfeed roller for the tablesaw or bandsaw. It’s been very versatile, and in a small shop, the more I can make a fixture do, the better I like it. You have some very nice storage systems in your shop. Thanks, oscorner. A shop is always evolving. I currently have in mind cutting a door into the back garage wall to access a woodlot where I’d like to build a shave horse for hand work. That would entail completely re-doing the whole back wall and lumber storage. Big idea, but I’d sure like to get it done. Projects first, though. I need to redo my shaving horse. It is a very handy tool. What style of shaving horse are you thinking of building? I think I want a dumbhead type, rather than an English bodger’s bench with the dowel across the swing to hold things. Lee Valley has a plan but it seems very light weight and somewhat limited. 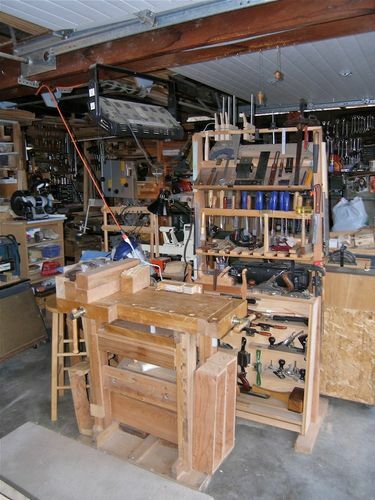 Scott Gibson’s Workbench Book shows several types. I’ve even seen one (somewhere) you can turn around on and have a carving setup on the back end, with a through-rope for a vise, anchored by your feet below. Interesting alternatives. What kind do you use, and would you make it differently if you rebuilt it? Edit: oh, just looked further, and that other horse is in Gibson’s book, under Carving. it has a dumbhead on one end, a sliding saddle and a small carving platform set up on the other end, with a rope vise. It’s large, but it can sure multi-task! I’ve been looking at Lie-Nielson’s version for a while. I do not do enough of this kind of work to justify the purchase or to make one for that matter. But I really like the craftsmanship. Ah sweet! I hadn’t seen that, Thank You. A ratched bridge really would be a challenge, wouldn’t it? You guys are getting me motivated again to bring this idea off the back burner. This design is amazing, especially for something usually so rough and ready. It does, however, look too nice to leave it outside in the weather! http://www.greenwoodworking.com/shorse.htm This is the plan I worked from when I made mine. I made a top from 3/4 plywood and used a piece of log that split with a nice curve as a seat back. I eventually removed the foot clamping assembly and went to using clamps instead. I took blocks and cut vee’s in them to help hold my letter openers by the handles so I could carve the blades with my drawknife.! http://farm1.static.flickr.com/143/342212086_42acf5158a_m.jpg! If I build another one I will go with an adjustable dumbhead. Nice letter openers, oscorner. I had seen John Alexander’s english shave horse, and I’m still debating between the two styles. It sure looks simpler to build, and maybe either would do, but what is your reasoning for wanting to rebuild using the dumbhead? You’d still have a foot-clamping assembly. Has the english version not worked well for your smaller pieces? Thanks! With the letter openers I found it was hard to clamp them far enough to the edge of the platform, that’s why I went to clamps. The dumbhead with a height adjustment would give me more flexibility. I’ve also seen a plan of the english version where the head has a hole that is offset. This way the head adjust by turning it on the pin which gives you varying thickness settings without having to drill adjustment holes in the neck of the head assembly. 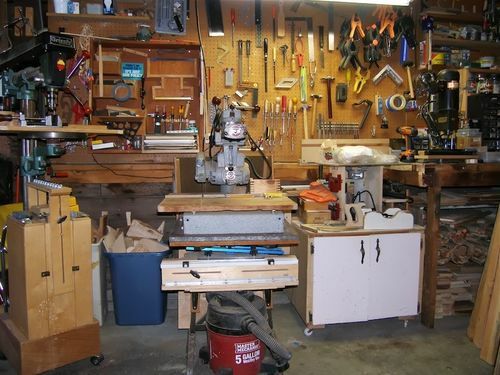 You have a nice shop and a nice set of tools to work with. I really love you hand tool collection. I look through the Lee Valley catalog and say I need it.. I need it.. :). And you shop has a lot of curb appeal judging from the first picture. I haven’t been around here enough to keep up with everyone..working too hard. Very impressive Barb. But please, don’t retire. Just ship those pesky old tools to me and buy some new ones ;-). Very nice shop, and I like your work. -- Got Wood? --- Somewhere along the way the people in Washington forgot that they are there to represent the people, not to rule them. HOT DEALS 2.0: Coupons, Sales, Black Friday, eBay, Amazon, BORG, Zoro, Woodcraft, etc.